The completion of MRT, a metro railroad transportation system of Taipei, not only does it bring convenience for locals here, it makes this big, crowded city friendlier. I was invited by a local bird club to their birding trips but I was not sure if I should be going out so soon after my operation. I hear bird calling every morning outside my bedroom window so I could not help but sneak out like a teenager...With four experienced trip leaders, we saw 38 species in a short three hours. I was just wow and wow one bird after another. Among all birds I saw, a colorful bird, local birders called it "Five-colored Bird",五色鳥, really caught my eyes! 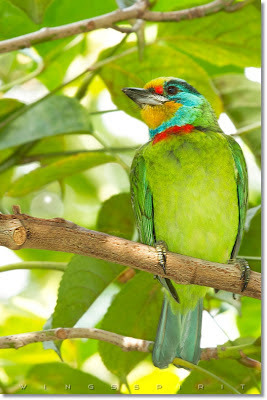 Taiwan Barbet, photographed in New Taipei City, Taiwan.